My wife and I try to explore new parks and preserves near where we live. We always seem to find somewhere new to visit if we just look. 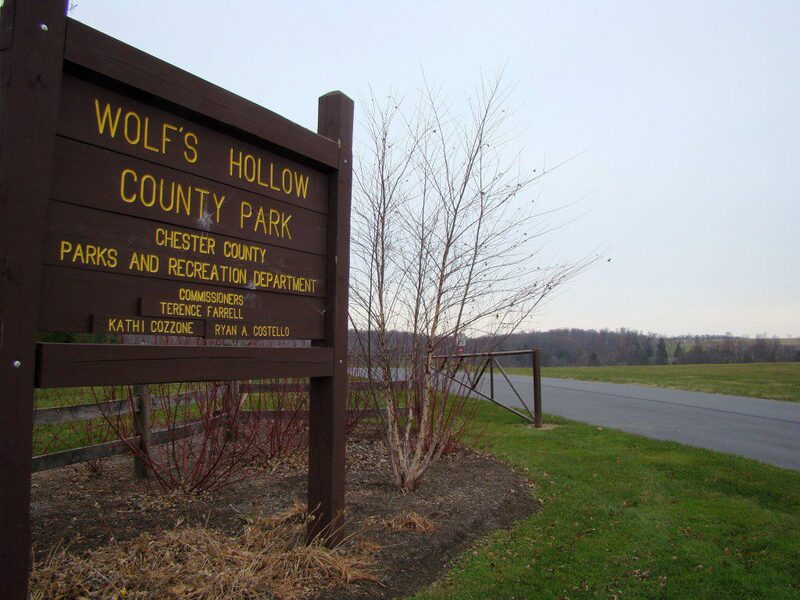 The other day, my wife suggested we go to a Chester County Park that I had never heard of, Wolf’s Hollow. This park is a big baby…what I mean is, it is only 2 years old, and it is 569-acres, which is big enough to take a really long hike. 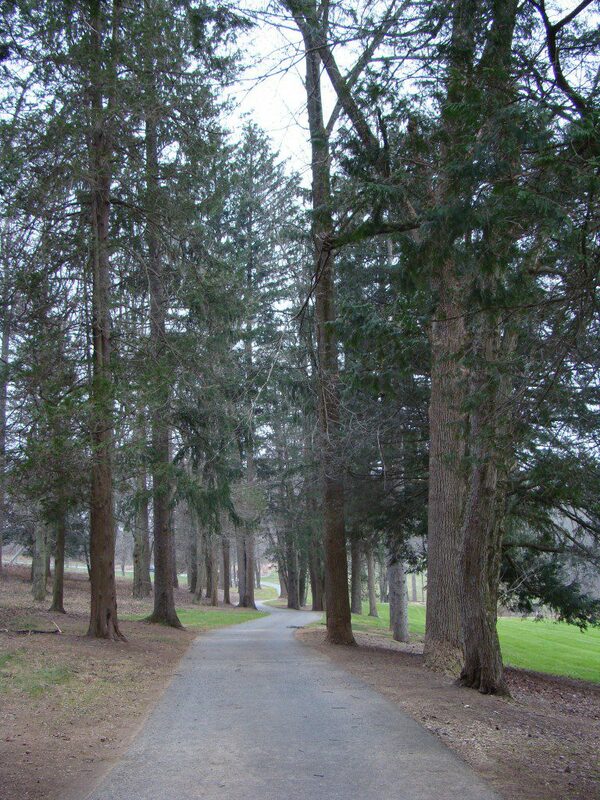 The entrance to Wolf’s Hollow County Park, in west-central Chester County, PA.
We walked 4.4 of the 7.9 miles of trails available at the park. In fact, the trails are only open for hiking. Hikers don’t need to worry about horses or bicyclists here! We saw only one other hiker during our 4.4 miles…and it was a Sunday! The yellow and orange trails made for a really nice loop. The most amazing things about this park are the natural features along the Octoraro Creek. As you walk the yellow trail, you are around 600-feet in elevation (much higher than anywhere in Delaware!) looking far down a gorge to the creek below. The forested hills are clothed in mature oak-hickory forest with Red, Chestnut, White, Black, and Scarlet Oaks predominating, with Pignut and Mockernut Hickory scattered around. The forest is extensive and with the leaves off the trees, you could easily see the surrounding landscape. 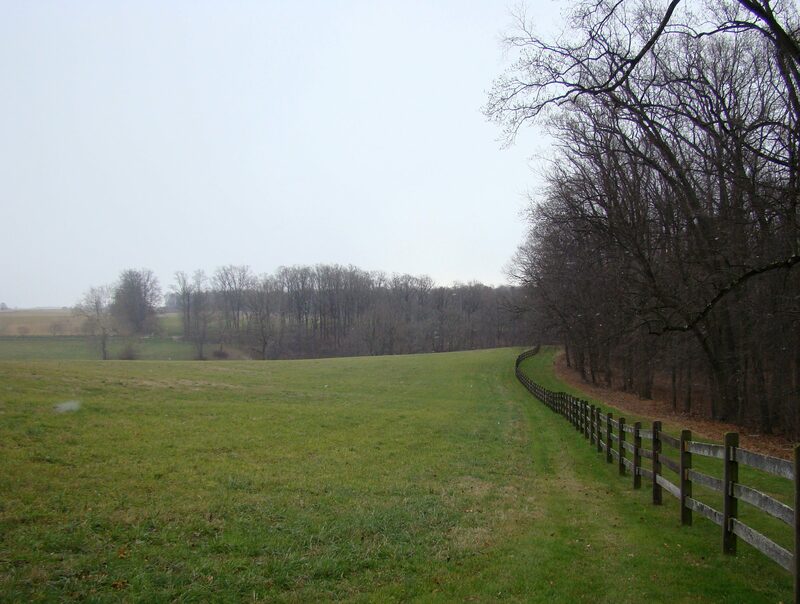 The beautiful forests at Wolf’s Hollow are bordered by some amazing open land with historic buildings and barns. Very well marked trails provided an easy hiking experience for the first-time visitor, and we could concentrate on enjoying our surroundings instead of trying to figure out where we were all the time. Although we weren’t far from home near Kennett Square, there were plants and animals here that we don’t see near us. One was the Chipmunk. We saw several scurrying around the rocks, nervously eying us as we passed. Also, we saw lots of Yellow Birch in one particular cove. I associate this tree with mountains further north, not Chester County. In fact, you feel like you are on an Appalachian ridge while walking the yellow trail. An 18th-century house called the Apple House sits along an intact historic road within the park. Our visit took place the Sunday after Thanksgiving. It was chilly and even snowed during our hike, which was a nice touch. Wildlife and birds were mostly quiet that day, but this is the kind of place that looks like it is oozing with birds during spring, summer, and fall. 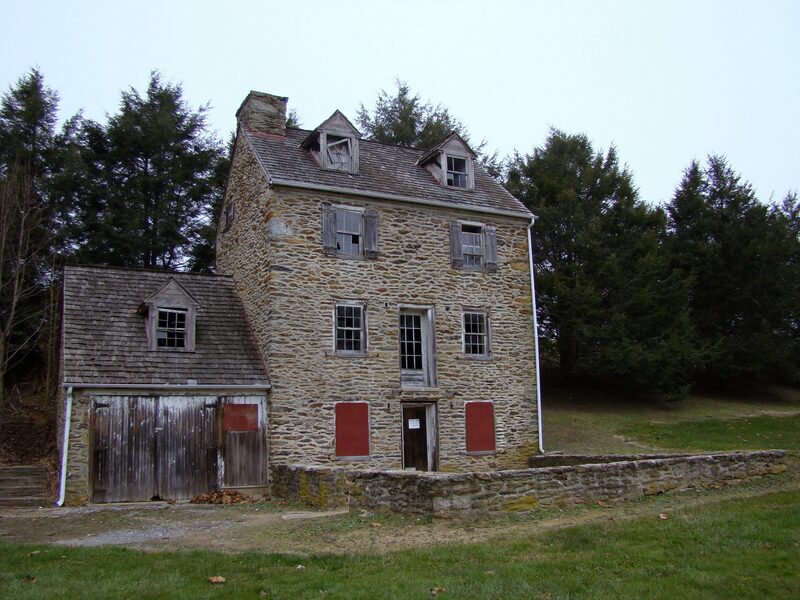 Take a trip 1/2-hour from Delaware to this wonderful new park and enjoy a quiet hike along the Octoraro gorge and through some Chester County history. A historic road that runs through the park. This doubles as a hiking trail. Do you have any places that you would recommend? I will post ideas of places to go that are in or near Delaware in this blog occasionally. After flying across the parking lot at Tri-State Bird Rescue, the Evening Grosbeak alighted in a cherry tree and fed on wild grapes for a few moments. Image by Derek Stoner, November 12, 2012. A bird is sometimes more than just a bird. Or, simply put, some birds take on a greater meaning because of the context in which they appear. For a short fifteen-minute span this morning, the stars aligned and the “perfect bird” appeared at an ideal place to be enjoyed by an appreciative audience. As I stepped out the front door of Tri-State, I noticed a bird call I’d never heard before. Briskly walking toward the sound, I soon found myself near Trail Marker 3 on the Middle Run Birding Trail. There at the top of an ash tree was a bird with a very large beak, and I knew what it was before even raising my binoculars. An Evening Grosbeak– right in front of me! I madly dashed back to my car and grabbed a video camera, digital SLR camera, and a spotting scope. The Evening Grosbeak, an adult female, perched at the top of a tree at the front door of Tri-State Bird Rescue for 10 minutes, to the delight of staff and volunteers watching below! Image by Derek Stoner, November 12, 2012. The grosbeak then flew over my head and landed near the end of the Tri-State parking lot, fetching up on a cherry tree adorned in wild grape and Oriental Bittersweet vines (first photo). I alternated between videotaping and photographing the bird, while frantically trying to dial the Tri-State number on my cell phone. I wanted other people to see this great bird! 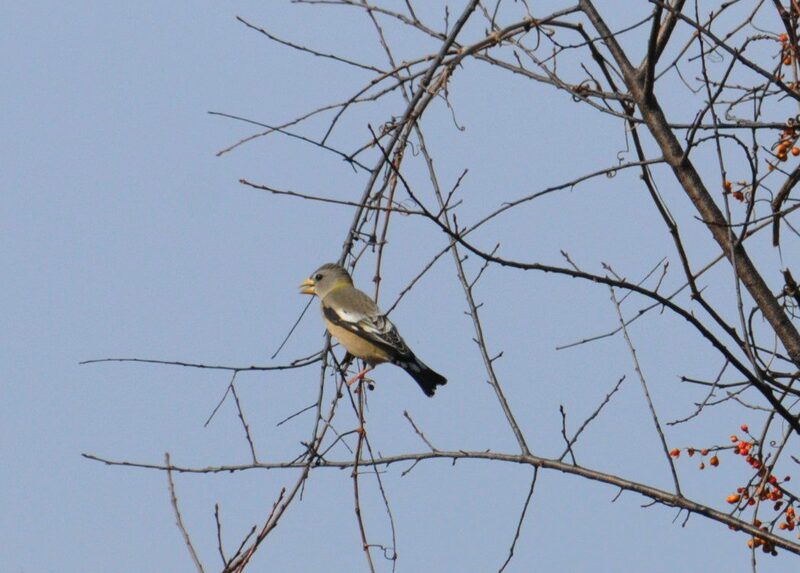 Incredibly, the grosbeak then flew and landed in a cherry tree right above the front entrance to Tri-State! I hurried over and set up the scope on the bird and hollered to nearby volunteers to alert the staff inside. Soon a number of staffers, including the director Lisa, came outside to see the Evening Grosbeak. Several folks told me that the had never seen this species before, and a couple said that they had seen them at their feeders in the late 1980’s. The appreciative crowd below this Evening Grosbeak had long looks through the spotting scope at a species that has not been seen in this region in a long time. Image by Derek Stoner, November 12, 2012. Now, what makes this bird particularly special is the context. For the past few weeks, a few lucky people have reported Evening Grosbeaks coming to their backyard feeders in the regions. Small flocks of these seed-eaters descend upon offerings of sunflower seeds and devour the seed quickly. 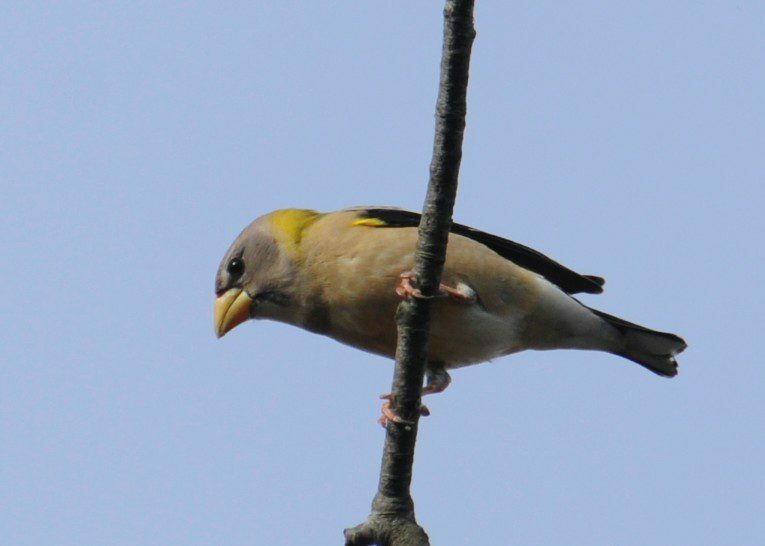 But to see just a single Evening Grosbeak, out in the wild and away from a feeding station– that is a unique observation. And of all the places to land– right above the front door at a bird rescue and research facility!? We watched the bird preen, clean its beak, and make “contact calls” as it sat on a branch for ten minutes. As with many bird sightings, being at the right place at the right time led to an exciting observation. The Evening Grosbeak is an “irruptive” species, spending most winters much further north in the boreal forests where they breed. The American Birding Association chose to feature this bird as their “Bird of the Year” and their website offers a lot of fun facts about this massive finch species. This winter, likely due to an extensive failure in the cone crops that this species favors, Evening Grosbeaks are heading south and being seen in places that they have not appeared for decades. 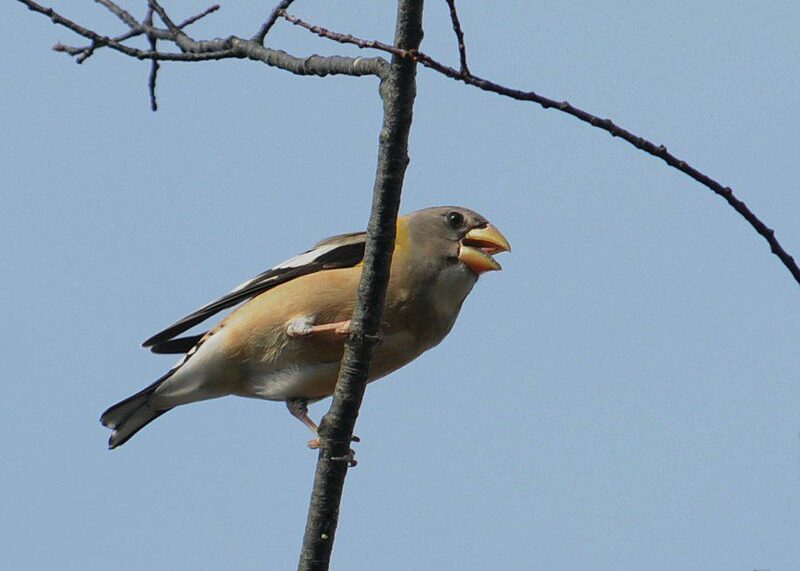 I saw my first (and only) previous Evening Grosbeaks way back in 1990 at our family backyard in Lancaster, PA. Even then, they seemed super rare and exciting. In the coming weeks, perhaps this region will be inundated by Evening Grosbeaks and we will become tired of them, taking down our bird feeders because they eat too much expensive seed. Or, more likely, these birds will remain somewhat elusive and a “lucky few” observers will get to see this iconic species from the Northern Woods. Only time will tell. Until then, keep a close eye on your feeders for this beautiful visitor from the North. On October 12, I led a program called the Cape to Cape Hawk Watching Adventure for the Delaware Nature Society. This program was originally the brainstorm of Bill Stewart, but he was unable to lead the program on the scheduled date, so I stepped in for him. The idea was to visit the Cape May Hawk Watch, then take the ferry over to Lewes, and visit Cape Henlopen Hawk Watch for a full day of raptor migration. As planned, we trekked to Cape May, leaving Ashland Nature Center at 6am, and arrived around 8am. The sky was swarming with raptors like American Kestrel, Merlin, Sharp-shinned Hawk, and many others. Hundreds of Pine Siskins and thousands of Tree Swallows swarmed by as well. The highlight, however, was an act of piracy by a juvenile Bald Eagle. It chased an Osprey that had a fish until the Osprey gave up and let go of its prey. The fish flew through mid-air over our heads, and in a move that would qualify it for Barnum and Bailey’s Circus, the Bald Eagle twisted around and snatched the fish. Amazingly, Hank Davis caught the transaction on his camera, and it is included in the short video below. Also featured are other birds we saw that Hank photographed, including a rare Clay-colored Sparrow. The ferry was followed by a parade of gulls on our trip to Lewes, but Cape Henlopen Hawk Watch proved to be slow. Where did the hundreds of raptors we saw go that we saw pass Cape May? Apparently some may fly out over the ocean, up Delaware Bay, or disperse in some other fashion into Delmarva on their way south. The day of our visit was not one where they flew straight across to Cape Henlopen, which happens on many days. Enjoy the video, and pay each of those Hawk Watches a visit some time this fall if you can.